Approximately 3.75"Dia. x 7.5"T; holds 9.1 ounces. EXCLUSIVELY AT NEIMAN MARCUS Blush Oro Bello water goblets. Each, 3.74"Dia. x 8.26"T; holds 8.79 ounces. 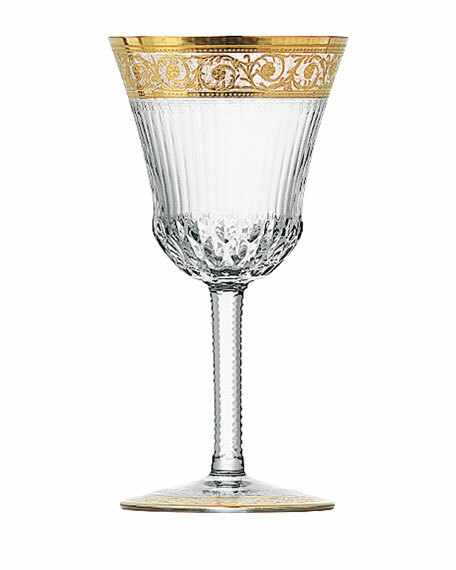 Beautifully hued blush and clear glass with hand-painted 24-karat gold detail. Handcrafted set of 4. Hand wash. Made in Italy. Handcrafted faceted crystal goblets. Two-piece set. Holds 6.76 ounces. 3.75"T. Dishwasher safe. Made in Hungary.